The mystical country of Morocco is synonymous with many things: thronging souks, towering mosques, sprawling Kasbahs and perfect piles of aromatic spices, waiting to mixed into a delicious dish. But perhaps the most beguiling is the Sahara. As the largest non-polar desert in the world, the Sahara’s 3.6 million square miles are almost incomprehensible. Its golden dunes stretch across 10 countries in North Africa from eastern Egypt through to Mauritania in the west. Morocco is home to two large, dune areas known as Erg Chebbi and Erg Chigaga where mountains of windswept sand dominate the landscape. While Erg Chigaga is more expansive, Erg Chebbi is more popular with travellers because of its towering 160m height. While the desert feels impossibly barren, the indigenous Berbers or Amazigh (free men) have lived on the outskirts of Saharan Africa for thousands of years, well before the Arabs arrived. In fact, rock paintings found in caves across the Sahara hint at the Berbers existence in prehistoric time, prior to recorded history. They have their own Afro-Asiatic languages with an alphabet loosely resembling ancient Egyptian. It’s also believed that a majority of the Moroccan population have Berber ancestry. 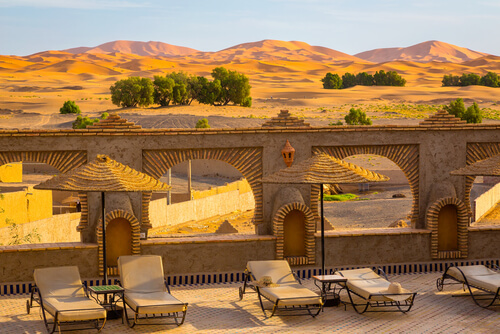 Begin your camping experience in the town of Merzouga, an oasis on the fringe of the desert with a strong Berber population. From the main street, the distant dunes are visible, emphasising the remoteness of the adventure you’re about to embark upon. Hop aboard a camel as the sun begins to sink and start your journey into the vast Sahara. Watch as the sun dances off the golden sand and casts spectacular camel-shaped shadows onto the dunes. After a short journey, you’ll reach camp. 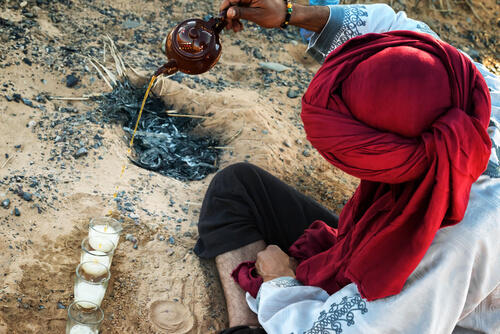 Sip on cups of mint tea and take in your home for the night – a peaceful respite from Morocco’s bustling cities. Far from one-man tents and sleeping mats, your desert lodgings include a proper bed, power and all the creature comforts of a regular hotel room. Each one is decorated with typical Moroccan finesse and finished with colourful local textiles you’ll wish you could take home. As darkness envelops the camp, Berber staff will prepare a traditional feast for you. Expect delicious tagines, couscous and spiced vegetables. After dinner, follow the fanoos (lanterns) to a spot on the sand and take in the millions of stars. Away from the city lights, the night sky is spectacular, with the milky way and various constellations visible to the naked eye. Cap off your night in the desert with a singalong, courtesy of your Berber hosts. Gather around the open fire and listen to them drum traditional songs. Dancing is encouraged so ignore your inhibitions and remember: you’re only in the Sahara once!